"Reynaud" redirects here. For the surname, see Raynaud. 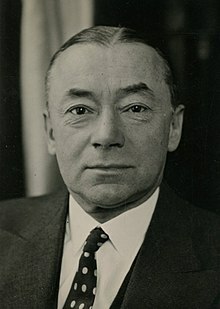 Paul Reynaud (French: [pɔl ʁɛjno]; 15 October 1878 – 21 September 1966) was a French politician and lawyer prominent in the interwar period, noted for his stances on economic liberalism and militant opposition to Germany. After the outbreak of World War II Reynaud became the penultimate Prime Minister of the Third Republic in March 1940. He was also vice-president of the Democratic Republican Alliance center-right party. Reynaud was Prime Minister during the German defeat of France in May and June 1940; he persistently refused to support an armistice with Germany and resigned on 16 June. After unsuccessfully attempting to flee France, he was arrested by Philippe Petain's administration. Surrendered to German custody in 1942, he was imprisoned in Germany and later Austria until liberation in 1945. Elected to the Chamber of Deputies in 1946, he became a prominent figure again in French political life, serving in several cabinet positions. He favoured a United States of Europe, and participated in drafting the constitution for the Fifth Republic, but resigned from government in 1962 after disagreement with President de Gaulle over changes to the electoral system. Reynaud was born in Barcelonnette, Alpes-de-Haute-Provence, the son of Alexandre and Amelie (née Gassier) Reynaud. His father had made a fortune in the textile industry, enabling Reynaud to study law at the Sorbonne. He entered politics and was elected to the French Chamber of Deputies from 1919 to 1924, representing Basses-Alpes, and again from 1928, representing a Paris district. Although he was first elected as part of the conservative "Blue Horizon" bloc in 1919, Reynaud shortly thereafter switched his allegiance to the centre-right Democratic Republican Alliance party, later becoming its vice-president. Reynaud held several cabinet posts in the early 1930s, but he clashed with members of his party after 1932 over French foreign and defense policy. He was not given another cabinet position until 1938. Like Winston Churchill, Reynaud was a maverick in his party and often alone in his calls for rearmament and resistance to German aggrandizement. Reynaud was a supporter of Charles de Gaulle's theories of mechanized warfare in contrast to the static defense doctrines that were in vogue among many of his countrymen, symbolized by the Maginot Line. He strongly opposed appeasement in the run-up to the Second World War. He also clashed with his party on economic policy, backing the devaluation of the franc as a solution to France's economic woes. Pierre Étienne Flandin, the leader of the Democratic Republican Alliance, agreed with several of Reynaud's key policy stances, particularly on Reynaud's defence of economic liberalism. Reynaud returned to the cabinet in 1938 as Minister of Finance under Édouard Daladier. The Sudeten Crisis, which began not long after Reynaud was named Minister of Justice, again revealed the divide between Reynaud and the rest of the Alliance Démocratique; Reynaud adamantly opposed abandoning the Czechs to the Germans, while Flandin felt that allowing Germany to expand eastward would inevitably lead to a conflict with the Soviets that would weaken both. Reynaud publicly made his case, and in response Flandin pamphleted Paris in order to pressure the government to agree to Hitler's demands. :519 Reynaud subsequently left his party to become an independent. However, Reynaud still had the support of Daladier, whose politique de fermeté ("policy of firmness") was very similar to Reynaud's notion of deterrence. Reynaud, however, had always wanted the Finance ministry. He endorsed radically liberal economic policies in order to draw France's economy out of stagnation, centered on a massive program of deregulation, including the elimination of the forty-hour work week. :503 The notion of deregulation was very popular among France's businessmen, and Reynaud believed that it was the best way for France to regain investors' confidence again and escape the stagnation its economy had fallen into. The collapse of Léon Blum's government in 1938 was a response to Blum's attempt to expand the regulatory powers of the French government; there was therefore considerable support in the French government for an alternative approach like Reynaud's. Reynaud's reforms proved remarkably successful; a massive austerity program was implemented (although armament measures were not cut) and France's coffers expanded from 37 billion francs in September 1938 to 48 billion francs at the outbreak of war a year later. More importantly, France's industrial productivity jumped from 76 to 100 (base=1929) from October 1938 to May 1939.:505 At the outbreak of war, however, Reynaud was not bullish on France's economy; he felt that the massive increase in spending that a war entailed would stamp out France's recovery. The French Right was ambivalent about the war in late 1939 and early 1940, feeling that the Soviets rather than Nazi Germany were the greater long-term threat. :522–523 Daladier regarded the war with Germany as the greater priority and so refused to send aid to the Finns, who were under attack from the USSR, then loosely allied to Germany, in the Winter War. News that the Finns had sued for peace in March 1940 prompted Flandin and Pierre Laval to hold secret sessions of the legislature that denounced Daladier's actions; the government fell on 19 March. The government named Reynaud Prime Minister of France two days later. Although Reynaud was increasingly popular, the Chamber of Deputies elected him premier by only a single vote with most of his own party abstaining; over half of the votes for Reynaud came from the French Section of the Workers' International (SFIO) party. With so much support from the left, and opposition from many parties on the right, Reynaud's government was especially unstable; many on the Right demanded that Reynaud attack not Germany, but the Soviet Union. :524 The Chamber also forced Daladier, whom Reynaud held personally responsible for France's weakness, to be Reynaud's Minister of National Defense and War. One of Reynaud's first acts was at a meeting of the Anglo-French Supreme War Council held in London on 28 March 1940, whose main outcome was the signing of a declaration with British Prime Minister Neville Chamberlain that neither of the two countries would sign a separate peace. A joint communiqué declared 'Both Governments mutually undertake that during the present war they will neither negotiate nor conclude an armistice or treaty of peace except by mutual agreement. They undertake to maintain after conclusion of peace a community of action for so long as may be necessary'. The Battle of France began less than two months after Reynaud came to office. France was badly mauled by the initial attack in early May 1940, and Paris was threatened. On 15 May, five days after the invasion began, Reynaud contacted Churchill and famously remarked, "We have been defeated... we are beaten; we have lost the battle.... The front is broken near Sedan." Indeed, such was the situation regarding equipment and morale that Reynaud received a postcard found on the body of an officer who had committed suicide in Le Mans. It stated: "I am killing myself Mr President to let you know that all my men were brave, but one cannot send men to fight tanks with rifles." On 18 May Reynaud removed commander-in-chief Maurice Gamelin in favour of Maxime Weygand. In early June Charles de Gaulle, whom Reynaud had long supported and one of the few French commanders to have fought the Germans successfully in May 1940, was promoted to brigadier general and named undersecretary of war. Reynaud and de Portes left the Hotel Splendid, Bordeaux, driving southeast ahead of the advancing German armies, intending to stop at Reynaud's holiday home at Grès, Hérault, (other sources state they were bound for his daughter's home at Sainte-Maxime) before fleeing to North Africa. On 28 June, with Reynaud at the wheel, their Renault Juvaquatre car inexplicably left the road and hit a plane tree at la Peyrade, near Sète; de Portes was all but decapitated while Reynaud escaped with relatively minor head injuries. Hospitalized at Montpellier, Reynaud was arrested on his discharge on Pétain's orders and imprisoned at Fort du Portalet. Pétain decided against having Reynaud charged during the Riom Trial of 1942, but surrendered him to the Germans instead, who removed him firstly to Sachsenhausen concentration camp, thence Itter Castle near Wörgl, Austria, where he remained with other high-profile French prisoners until liberated by Allied troops on 7 May 1945. Major Josef Gangl, a Wehrmacht officer who had gone over to the anti-Nazi Austrian resistance, was killed by a sniper's bullet while trying to move Reynaud out of harm's way during the Battle for Castle Itter on May 5, 1945. While hospitalized at Montpellier, Reynaud allegedly told Bill Bullitt, American ambassador, "I have lost my country, my honour, and my love." After the war, Reynaud was elected in 1946 as a member of the Chamber of Deputies. He was appointed to several cabinet positions in the postwar period and remained a prominent figure in French politics. His attempts to form governments in 1952 and 1953 in the turbulent politics of the French Fourth Republic were unsuccessful. Reynaud supported the idea of a United States of Europe, along with a number of prominent contemporaries. Reynaud presided over the consultative committee that drafted the constitution of France's (current) Fifth Republic. In 1962, he denounced his old friend de Gaulle's replacement of the electoral college system by a direct public vote for the Presidency. Reynaud left office the same year. By his first marriage in 1912 to Jeanne Anne Henri-Robert, he was the father of a daughter, Collette, born in 1914. At some time in the early 1920s, Reynaud was introduced to Hélène Rebuffel by Andre Tardieu, a friend of her father's. Rebuffel's father, however, was displeased at her relationship with a married man, actively seeking other suitors for her, and she was eventually persuaded to marry the Italian Comte Henri de Portes. After she had borne him two children, the marriage failed, and when Reynaud and his wife separated in 1938, Hélène de Portes was his mistress until her death in the road accident at Frontignan in 1940. Reynaud and his first wife were finally divorced in 1949. Reynaud then married Christiane Mabire (one of his former office assistants, who had voluntarily joined him at the Castle Itter in 1943) at Versailles in the same year, at the age of 71. Mabire had already borne him a son, Serge Paul-Reynaud, in 1945; they had two more children, Evelyne, in 1949, and Alexandre in 1954. Reynaud died on 21 September 1966 at Neuilly-sur-Seine, leaving a number of writings. 18 May 1940 – Philippe Pétain enters the Cabinet as Minister of State. Reynaud succeeds Daladier as Minister of National Defense and War. Daladier succeeds Reynaud as Minister of Foreign Affairs. Georges Mandel succeeds Roy as Minister of the Interior. Louis Rollin succeeds Mandel as Minister of Colonies. Léon Baréty succeeds Rollin as Minister of Commerce and Industry. 5 June 1940 – Reynaud succeeds Daladier as Minister of Foreign Affairs, remaining also Minister of National Defense and War. Yves Bouthillier succeeds Lamoureux as Minister of Finance. Yvon Delbos succeeds Sarraut as Minister of National Education. Ludovic-Oscar Frossard succeeds Monzie as Minister of Public Works. Jean Prouvost succeeds Frossard as Minister of Information. Georges Pernot succeeds Héraud as Health Minister, with the new title of Minister of French Family. Albert Chichery succeeds Baréty as Minister of Commerce and Industry. ^ a b "Paul Reynaud". spartacus-educational.com. Retrieved 1 April 2018. ^ a b c d e f g Jackson, J. (2003). The Fall of France. Oxford University Press, Oxford. ISBN 019280300X. ^ Shlaim, Avi (July 1974). "Prelude to Downfall: The British Offer of Union to France, June 1940". Journal of Contemporary History. 3. 9: 27–63. doi:10.1177/002200947400900302. JSTOR 260024. ^ Anon. (1940). M. Paul Reynaud victime d'un accident d'automobile. Le Petit Meridional, 29 Juin 1940. ^ "Fort du Portalet Office de tourisme Vallée d'Aspe tourisme Parc National Pyrénées séjours balades randonnées". www.tourisme-aspe.com. Retrieved 1 April 2018. ^ Barber, Noel (1976). The Week France Fell. p. 299. ^ "Sepp Gangl-Straße in Wörgl • Strassensuche.at". Strassensuche.at. ^ Moss, N. (2003). 19 Weeks. Houghton Mifflin Harcourt, New York. ISBN 0-618-10471-2. Connors, Joseph David. "Paul Reynaud and French national defense, 1933-1939." (PhD Loyola University of Chicago, 1977). online Bibliography, pp 265-83.
de Konkoly Thege, Michel Marie. "Paul Reynaud and the Reform of France's Economic, Military and Diplomatic Policies of the 1930s." (Graduate Liberal Studies Works (MALS/MPhil). Paper 6, 2015). online, bibliography pp 171-76. Nord,	Philip. France 1940: Defending the Republic (Yale UP, 2015). Paul Reynaud (11 August 1945). "Saved From Nazis At Castle Itter". The Winnipeg Tribune. Winnipeg, Manitoba, Canada. p. 2. Retrieved 22 November 2016 – via Newspapers.com.